This hand-held (3”x6”), battery-powered (2 AAA batteries, optional AC power) Spanish translator is a good value. It does a lot more than simply translate. 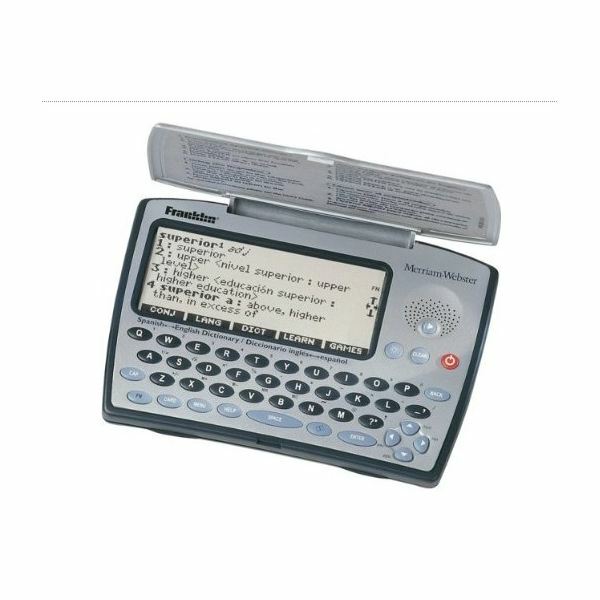 If all you are looking for is a straightforward translator, you can buy cheaper products, but with fewer features and a smaller display than the BES-1850. Shop around, though. This unit is no longer available on Franklin's website but you can buy it on Amazon.com for $140. The translator comes with a 1.5” x 3” black on grey LCD display, which is somewhat faint even with the backlighting feature. The display is good enough, but it detracts from the overall excellence of this translator. However, the translator can be set to display ten lines of text. This multi-lined feature gives it a distinct advantage over the cheaper one- or two-lined products. The good news is that the translator comes with about 600 useful traveler’s phrases recorded in an actual human’s voice. Find the phrase you need and press the speaker button to play a very good rendition with not-too-bad sound fidelity. 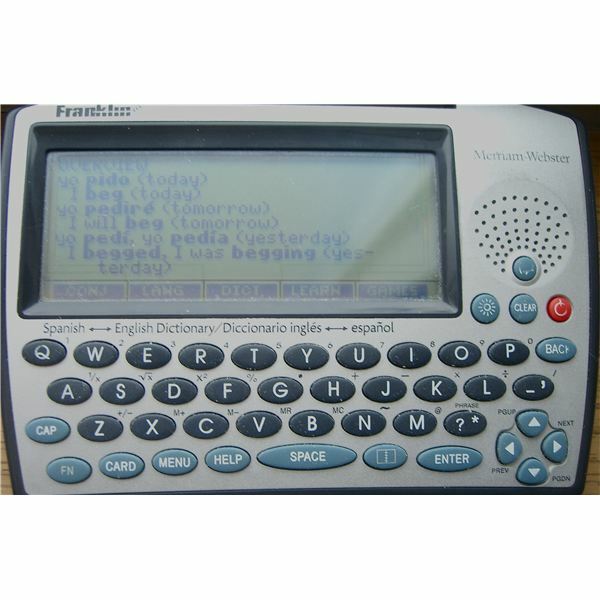 The bad news is that when using the speaking feature in the dictionary mode, you hear a gravelly, computerized pronunciation that is somewhat hard to understand. However, since there is a vast number of words in the translator (Franklin claims there are 5 million translations available, but who's counting? ), what may be lost in sound quality is definitely gained in the scope of available translations. Press the red power button and the translator boots up in the language of the last word you looked up. (You can set the translator to boot up with a random word to help build your vocabulary.) 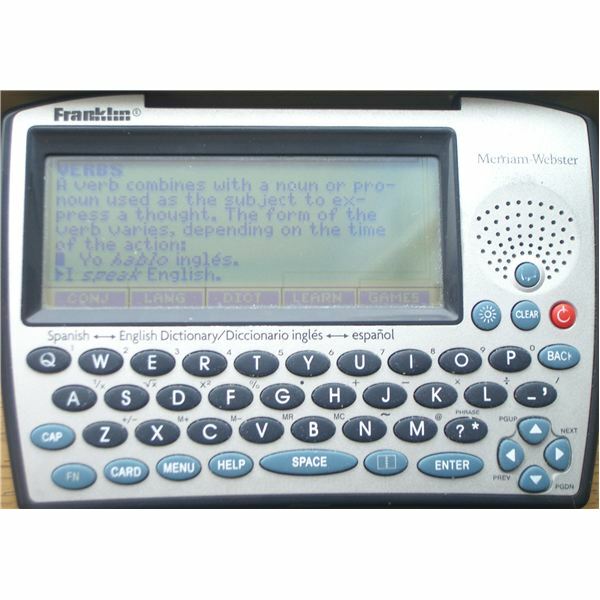 The LCD screen displays five touch buttons at the bottom: (1) conjugating a verb, (2) switching back and forth between Spanish and English, (3) returning to the Dictionary mode, (4) keeping your own vocabulary list, and (5) accessing some nifty word games. The translator is lightning fast. Enter a word in English or Spanish to get an almost instantaneous translation. If you misspell the entry, the translator defaults to a suggested word list. If you enter the word in the wrong language mode, you will either get a “sorry” message or a list of words that match your entry. Just press the “LANG” button on the touch screen and the translator will try again. This is a good feature for the Spanish student who needs fast access to conjugated forms of verbs. Enter a Spanish or English verb and press the “CONJ” button on the touch screen. What pops up is a quick conjugation overview of the verb, which is somewhat redundant, and a little confusing. However, press the “CONJ” button again to cycle through the various tenses of the verb. Note: The speaking function does not work in the conjugation mode. Save your own word list (up to 40 items) for flash card and pronunciation practice. You can dump a new word automatically into your list by pressing the “LEARN” button on the touch screen. Beginners will also like the grammar tutorial accessible from the “LEARN” feature. Also, there are some amusing “Hangman” and word-guessing games to while away the hours on the tour bus. The translator comes with a clock and a pretty good calculator. You can store 100 names, telephone numbers and addresses in its data bank. (Caution: Change your batteries very quickly, or you lose everything you programmed.) Also, there is a metric (temperatures, weights and measures) and currency converter that is useful when traveling.